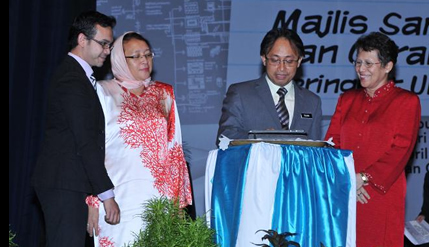 BANGI, April 16 2012 – Some twenty scientists and researchers from The National University of Malaysia (UKM) who have successfully commercialised their inventions or products were given recognition by the university today and rewarded with payments totaling over RM137,000. The University will also be awarding incentives totaling RM48,000 that is RM3,000 for every innovation or invention which obtained a patent or industrial certification to 16 researchers. The rewards were given out at a ceremony celebrating the UKM 2012 Science Year and National Innovation Movement at the Dewan Canselor Tun Abdul Razak (DECTAR) in the campus here this evening. It was officiated by the Director-General of the Higher Education Department, Prof Dato’ Dr Rujhan Mustafa, representing Higher Education Minister, Dato’ Seri Mohamed Khaled Nordin. The incentive payments are part of UKM’s policy to encourage the commercialisation of intellectual property gained by its researchers. Vice-Chancellor, Prof Tan Sri Dato’ Wira Dr Sharifah Hapsah Syed Hasan Shahabudin said UKM has pioneered a new approach to developing research and innovation so that new ideas would be generated by successful entrepreneurs who brought their products into the market. UKM has to date produced more than 400 intellectual property rights. Realising the importance of new technologies and knowledge, the university has decided to bring valuable ideas and research outcomes, for commercialisation. More than 30 of the intellectual copyrights has been successfully marketed by 33 companies set up by the university, she said. Prof Sharifah Hapsah said that UKM has also succesfully developed a curriculum of academic entrepreneurship as part of its core subjects to encourage a culture of innovation among academics, researchers and undergraduates. Prof Rujhan congratulated UKM’s scientists and researchers who had produced inventions that could bring lucrative returns. UKM with Jatro Singapore Pte Ltd to carry out research on jet fuel for commercialisaation with an allocation of RM7.9 million. UKM with Comintel Green Technologies for research on biomass. Casemix Solution Sdn Bhd, a UKM start-up company with KPJ International College of Nursing and Health Sciences on medical technology . UKM Technology with Revongen Corp Sdn Bhd to commercialise medical biotechnology including Meliodosis Rapid Diagnostic Kit. UKM is also collaborating with partners in the industry to develop and market its intellectual property.